Hammer and Tongues Holdings, through its lottery gaming provider, Africalotto, has introduced mobile and online gambling to the Zimbabwean market with an Android application called The Africalotto Mobile App. 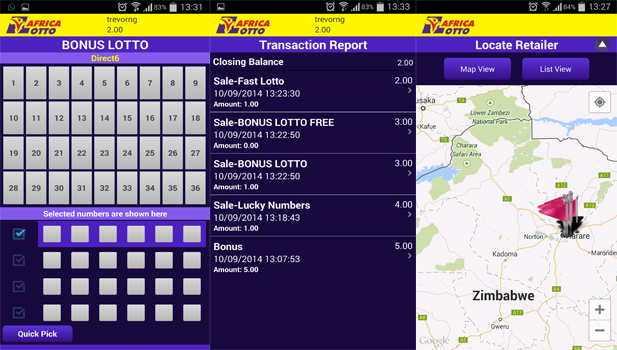 Through this app,the first of its kind in Zimbabwe, registered users can place bets on the different lottery games that Africalotto already provides through its retail network. These include Lucky Numbers, BONUS LOTTO and Fast Lotto. Find a retailer – This is for identifying where to top your account or to redeem your winnings on a bet across all the 10 provinces in the country. This comes with a list and map view. Reports – This details all transactions and purchased tickets. Reports detailed here include withdrawals on any winnings or money already in your account. Results Report – an e-solution for lotto results which has always been one huge problem on its own. Its really useful if you miss the ZBC Saturday night results broadcast. 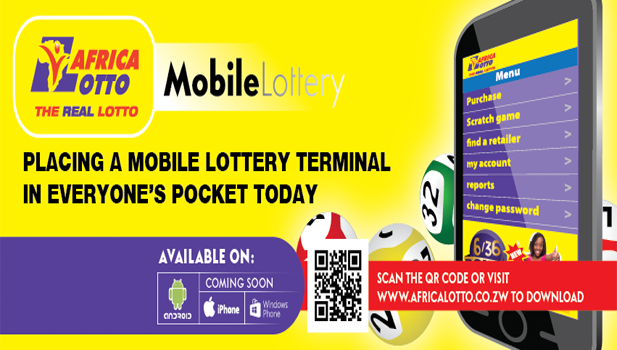 While other lottery services outside Zimbabwe have developed apps for this one feature Africalotto has made it an add on to a host of other services. An Invite A Friend Feature – There’s no fun in playing lotto on your own apparently. 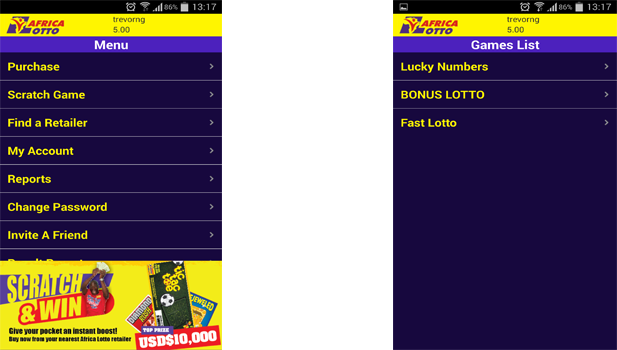 Its a smart move on Africalotto’s part as the whole referral aspect will help grow the network of mobile Lotto players. So how does one place bets? Well once you register your account on the app (You have to enter your Date of Birth which safeguards against underage gambling) you have an account that you can credit with money via mobile money or at any Africalotto outlet. The first Africalotto agent i spoke to assured me that I could use EcoCash, telecash and OneWallet for deposits but on my account the only mobile money option I saw was for EcoCash. This was presumably linked to the phone number I had used for registering. Withdrawals are made at the same outlets as well. The app can be used on any device running Android Ginger Bread and later versions with a download link for its apk and instructions for setup available on the Africa Lotto website and on a QR code that has been placed on the adverts for the app. Africalotto says it is working on an iOS and Windows Phone version of the app as well. The developers/owners of the app put up a note (misleading one for that matter) that states how lottery apps are not allowed on Google Play hence the download and installation of an app that your device will warn you against. This is likely to deter users skeptical of installing apps that don’t look legitimate, especially where monetary concerns are an issue. The app scores points for coming in to provide a solution that most would have expected the local lotto and gaming houses to execute by now. Local gaming has been ripe for tech disruption for a while so perhaps the first visible attempt like this one will help show how the opportunity exists along with solutions. Perhaps we are going to see sports betting being tackled next? Have you used the Africalotto app? What do you think of its functionality? You can share your opinions in the comments section below. I have to admit once you figure it out, it is quite a decent app. Looking forward to hearing about the first Jackpot winner through the app, hopefully it’s me! Pretty much the first thought that came to mind. They gotta make sure one of the near future winners is a mobile (app) player and then make noise about it, that way they fool them gamblers into signing up, who knows, perhaps fool us non-gamblers too! The lotto mobile application is not being accepted because it is not from the android market! what is the solution? This app is keeping on showing App not installed when finishing updating it, so whats the solution now??? we need betting place of africalotto,the real lotting to Plumtree Town,its hard to travel everyweeked to Byo to bet,we need Africalotto Plumtree,and its hard to bet by mobile,please help we love u &need u in Plumtree,thanks. is this app not open to stealing gambler’s money? why is it that some results are reflected immediately after the bet as “try again later” but others are shown as “results awaited” up to a point where you end up not seing it again on the list. The list can only show ten lines of results for as long as you keep on betting the previous results will disappear. To improve the performance of the app only last 10 results are shown. “Result awaited” occurs if the draw is yet to happen, and “better luck next time” that u see immediately is for those draws that are automated and not live televised draws that need auditors to verify results.